As a rule, I usually try to avoid books set in space. I don't really know why but the space setting always make me roll my eyes and lose interest. I also try to avoid science fiction for the same reason. I know what I like, and I don't really like those two things. Unfortunately, the hype machine got to me though and I requested a copy of this title from Edelweiss. So that leaves me here. Writing a review for a book that was mediocre and I don't know if it was mediocre because I dislike space and science fiction or just because it was mediocre generally. Zenith follows Androma who is occasionally referred to as the Bloody Baroness. She is supposed to be this cutthroat badass who travels the galaxy and doesn't care about anyone. Except she does care about a lot of people and she actually isn't that badass. She's the leader of a ragtag group of girls who kind of reminded me of the Guardians of the Galaxy if they didn't need to guard the galaxy. I felt like the stakes in Zenith were very low. The other problem I had with this book was that nothing happened. I feel like I spent the whole book waiting for the real action to start and it never did. Even the ending occurred during the middle of a scene. There were also so many characters that they became interchangeable, an amalgamous blob rather than real people. If they weren't Androma or her ex-boyfriend (maybe current boyfriend) they didn't matter. Still, certain parts had me entertained. At the end of the day, something made me want to keep coming back to finish this book. That leaves me feeling like this was a middle of the road read.There was something there, even if it didn't connect for me. I don't think I'll pick up the sequel though. Not because I hated this book, but because I don't feel strongly either way. OOh I haven't heard of this one before. For you not being a fan of space novels 3 stars isn't bad. I'm going to have to see if my library will be getting this in. Great review! I usually avoid books set in space as well just because I don't enjoy novels/stories set in that particular setting. 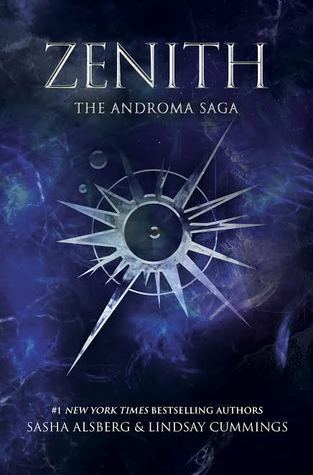 I've been seeing Zenith everywhere though and I'm actually debating on whether I should pick it up or not, just out of curiosity. I've also heard both good and bad things about it so, definitely on the fence about this one! Thank you for sharing!